When I saw Fyberspates tweet last week about adding new Sparkle fibre to their shop I was unable to resist. Pretty colours, glitter, merino & silk? Obviously I ordered two batches. It did not disappoint, I have already spun one lot. As usual, I hit no particular gauge, it’s something like a light DK. This is not my best spinning by a long way, in fact it was quite difficult. I don’t know whether it was the slipperiness of the silk or the short staple of the ridiculously soft merino but it turned out very uneven. I don’t think it matters, it will make a lovely pair of cabled hand warmers. The other batch is still to spin. 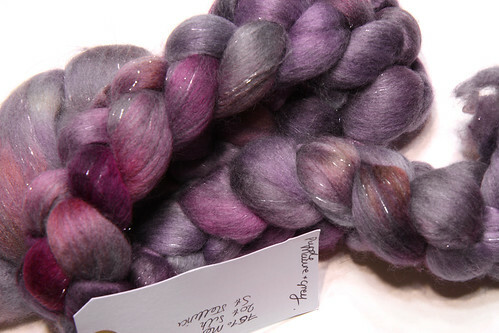 Nothing hangs around for long on the Fyberspates website, they have a few shades of Sparkle Fibre left but they’ve already sold out of both these colours – be quick! 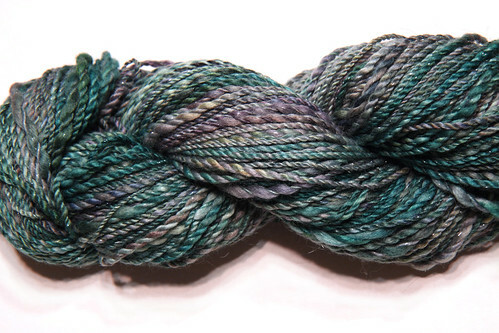 The one you have spun and photographed for this post reminds me of my favorite Colinette yarn, Zanziba.